Welcome to our condo in the woods - though it's a condo, our guests often comment once they step inside they think they're in a cozy cabin. We're on 40 secluded, wooded acres on a ridge above town and the lakes. Looking for water views? Our deck affords expansive views of Shadow Mountain Reservoir, Mount Baldy and the snow capped mountain ranges. The 'townhome' style of our complex means we are in separate, staggered buildings, providing windows on three sides and plenty of trees, mountains and water to gaze upon. Enjoy the quiet of our park-like setting with the convenience of town within easy reach on foot or by bicycle. The gateway to Rocky Mountain National Park is just one mile from our door. We are on an 'elk run' and in the fall they bugle just below us. Other times of year expect to see bear and fox. Distinctively decorated, our condo has been completely remodeled down to the rafters. 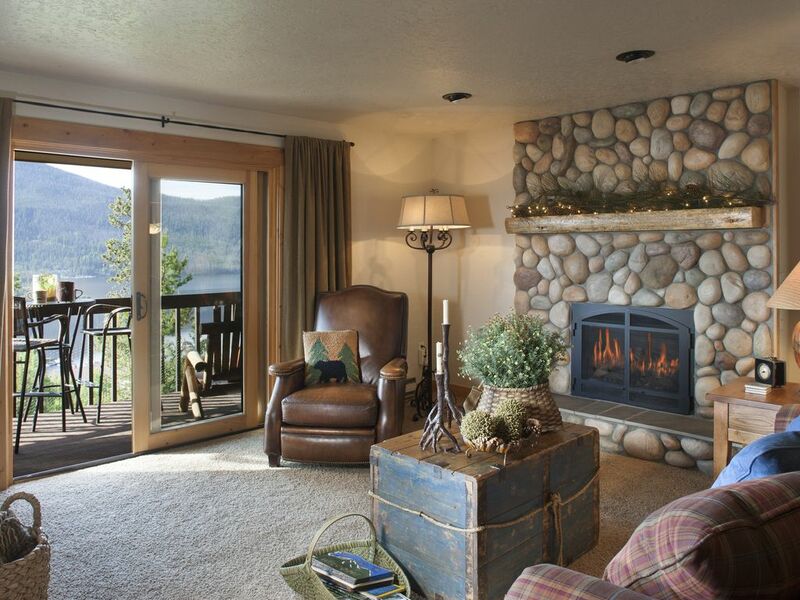 Our guests describe our property as 'cozy' and 'romantic.' Luxury amenities abound. Your hosts - Rob and Katie. We live in Boulder, Colorado and enjoy Grand Lake where we love to cook leisurely meals and enjoy a glass of wine watching the sunset over Grand Lake and Mount Baldy - all this after a day of hiking or fishing! We fell in love with the views from our deck, and our guests have too! The million dollar setting prompted us to gut the interior and create the vacation rental we had always tried to find - rustic, but with great linens, towels and kitchen equipment. Quiet, park-like setting on 40 private acres with views in all directions and abundant wildlife viewing, yet very close to town. Charming interior décor with all the comforts of home, and did we mention the views over the lake!? Within 1 mile of Rocky Mountain National Park entrance. Rocky Mountain National Park gateway village with rustic Adirondack architecture typical of the earlier 20th century. Grand Lake is the largest natural lake in the State of Colorado. There are two other large reservoirs in the vicinity with some of the best boating and fishing in Colorado. Located on a premiere ridge above town and the lakes. Beautiful, unobstructed views. Gorgeous views of mountains in all directions. High quality washer/dryer and rack for drying delicates. Ample parking directly in front of unit. Views of Grand Lake and Mount Baldy from living room. High quality dishes/glassware and barware. Kitchen has dining table that can seat four and breakfast bar. Satellite service and high def flat screen tv in living room, second entertainment center with flat screen tv in master bedroom. Sound system in living room, Bose I-Pod docking station. Balcony has seating for 4, cabaret table with 2 seats, 2 Adirondack chairs and sweeping views of Grand Lake and Shadow Mountain Reservoir. Rentals available at Grand Lake Marina. Deck has seating for 4, cabaret table with 2 seats, 2 Adirondack chairs and sweeping views of Grand Lake and Shadow Mountain Reservoir. World class skiing nearby - 15 minutes to Sol Vista, 45 minutes to Winter Park, one hour to Steamboat. Grand Lake Golf Course is a five minute drive from this condo. Great accommodations! Perfect location! Very clean! Well appointed! Had everything we needed!! Fantastic property with an amazing view! We have rented this cozy and beautiful condo numerous times both in the winter and summer due to our love of hiking and snowshoeing. When you instantly step inside you feel like it’s a “home away from home”. The decor and personal touches, as well as the luxury amenities make your stay so enjoyable and comfortable. The view from the balcony is spectacular of the lakes and mountain ranges and whether you’re out for adventure or just coming for rest and relaxation, this condo will not disappoint. The owners are great to work with and want their guests to enjoy their property as much as they do. This condo is located in a quiet area and is near the entrance to Rocky Mountain National Park and the town of Grand Lake which makes it very convenient. We would recommend this property and will be coming back again. We had a wonderful time! And oh did it snow! We loved it! Thank you for sharing such a special place! Wonderful property with a cute little town nearby. Condo has a breathtaking view with everything you need for a comfortable stay! Beautiful view, very cozy clean cabin! Located on a ridge overlooking the Town of Grand Lake to the east. The west entrance to Rocky Mountain National Park is only 2 miles north (only 1/2 mile to the boundary of the Park) and the Grand Lake Golf Course and tennis courts are 1 mile west. Extra person charge of $10 per night for children under 12 years and $15 per night for children over 12 years for parties of more than four people, no more than 4 adults. Restrictions: No pets, no smoking. If it is determined that these restrictions are violated the damage/excessive cleaning deposit will be forfeited. Condominium Rules: Homeowner Association rules for our complex must be strictly adhered to. These rules are posted in the condo and will also be mailed to you with your welcome packet. Number of People: The number of people staying overnight in the property shall be limited to the number agreed to as set forth above. Arrival and Departure Time: Check-in is after 4:00 pm and check-out is before 11:00 am. If you would like an earlier check-in or check-out, please call us the day before and we will accommodate you if no other guests are arriving or leaving the day of your departure or arrival. Keys and Directions: A welcome packet will be e-mailed to you two weeks prior to your stay including the key and directions to the property, a checklist for arrival and departure, local contact information, a list of activities and resources in and around Grand Lake and other useful information for your stay. Termination: The owners reserve the right to terminate this agreement and require the renters to vacate the property immediately if the property is being used for unlawful purposes or for any violation of the terms of the agreement.